One of the very very few things I like about using a Windows XP machines is the Windows Picture and Fax Viewer. This is one of Microsoft’s killer apps, as it is simple to use and works well. Printing is fantastic too. It can actually handle graphics over a megabyte, unlike previous versions of Windows. 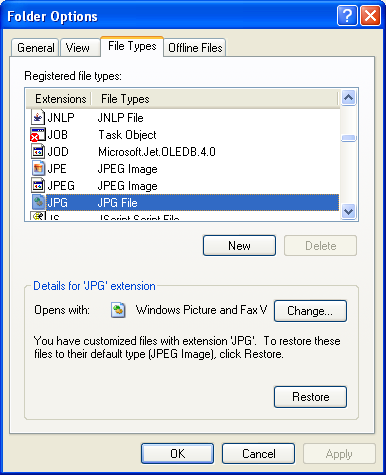 Now, how does one restore the JPEG association with Microsoft’s image viewer once I’ve installed a stupid program which hijacks Images types! Sidenote: I still find Debian’s feh best for viewing images. It is fast. Is there anything faster? And while I am here, I also think Window’s dialup software rocks compared to anything I’ve seen in Debian when it comes to ease of use. Parent-proof.